Just got a question about the differences between OneDrive (for Business) and SharePoint Online… As it’s not my core knowledge, I just did some quick research, which might serve your knowledge too… Here we go. The page on OneDrive for Business Service Description has a very interesting comparison, but IMHO, it’s missing a bit of color. So, I’ve reworked the page slightly (but all credits to the Microsoft Product team. 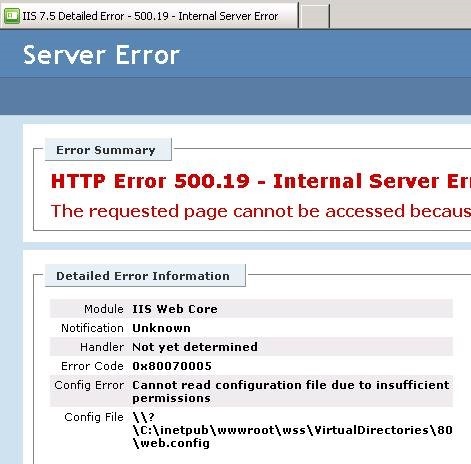 When you’re taking care of your FIM Server, more specific the FIM Portal server running Sharepoint, you might encounter some events in the event viewer, where Sharepoint is complaining about the lack of disk space. If you don’t have plenty of disk space, (*) then stop reading and fix it, bookmark this page and come back. Now, plenty of memory and plenty of disk is the problem. By default Sharepoint runs the health analyser and has gotten 2 rules that compare the amount of memory against the amount of free space. So if you have a huge amount of memory, this rule can easily fill up your application event error log in your event viewer. Secondly, you can disable the redundant error messages by the SharePoint Health Analyser. Although the post is focusing on SBS2011, it does also apply to SharePoint Server 2010 (Foundation). Application Server job failed for service instance Microsoft.Office.Server.Search.Administration.SearchDataAccessServiceInstance (0a460b52-213c-4cd3-8e0a-b7e33ac6b8d6). Reason: An update conflict has occurred, and you must re-try this action. The object SearchDataAccessServiceInstance was updated by DOMAIN\SPFARMSvcAccount, in the OWSTIMER (5016) process, on machine FIMPORTALSERVER. View the tracing log for more information about the conflict. Microsoft.SharePoint.Administration.SPUpdatedConcurrencyException: An update conflict has occurred, and you must re-try this action. The object SearchDataAccessServiceInstance was updated by DOMAIN\SPFARMSvcAccount, in the OWSTIMER (5016) process, on machine FIMPORTALSERVER. View the tracing log for more information about the conflict. <Data Name=”string3″>Microsoft.SharePoint.Administration.SPUpdatedConcurrencyException: An update conflict has occurred, and you must re-try this action. The object SearchDataAccessServiceInstance was updated by DOMAIN\SPFARMSvcAccount, in the OWSTIMER (5016) process, on machine FIMPORTALSERVER. View the tracing log for more information about the conflict. 1. Check the SharePoint Farm account password, Try to (re)start the sharepoint timer service. Check for logon failure. 2. Clear the SharePoint cache on the server where the timer service is running. Working on a case where a FIM configuration has moved from development to production. The customer’s production environment is a highly secured environment with a server security lockdown. The customer is using a custom tool for server profiling and local security lockdown. After installing and configuring FIM, the FIM portal was loading blank. So we needed to investigate what was going wrong. secureresources Performs SharePoint Products and Technologies resource security enforcement on the server. For example, security is enforced on files, folders, and registry keys. Although very useful to reset the security, it didn’t change the behaviour on the portal (still loading blank page). Using procmon (http://technet.microsoft.com/en-us/sysinternals/bb896645.aspx), we found out that we had quite some errors. Just a hint: exclude ‘success’ messages and filter on the targeted application pool account. We first checked the default WSS group memberships for the AppPoolAccount. Just to double check, during troubleshooting we removed the WSS_WPG group from the FIM Portal application pool (default Sharepoint Application pool). So that made the situation even worse. Back to the procmon results, as procmon threw errors on the impersonation of the application pool account we checked the local security policy. And the AppPool account appeared to be removed from the setting or was not member of the groups referenced in the setting. Do not make the Application pool account member of the local admins. Make sure the Application Pool account has the “Impersonate a client after authentication” right in the local Security Policy.